The greater part of this hot Monday was spent cleaning profiles, measuring angles, and photographing units. A bit of digging turned up at least one exciting new development. Digging deeper into a square unit just a few feet south of the redan’s apex, the student archaeologists began exploring the muddy soil at the water table. 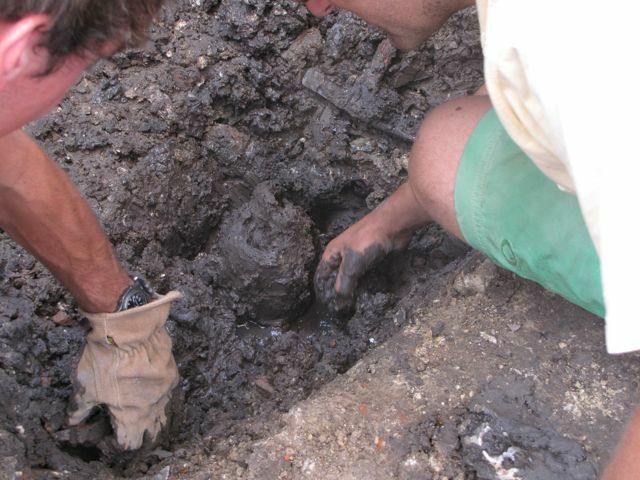 Here in the South Carolina lowcountry we call this watery stuff “pluff mud,” and its distinctive organic odor quickly filled the dig site. 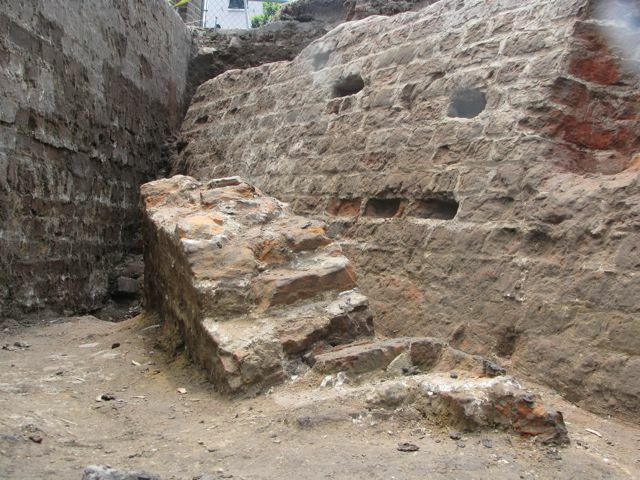 This layer soon proved to be rich in cultural artifacts, most probably dating back to the very early 1700s. 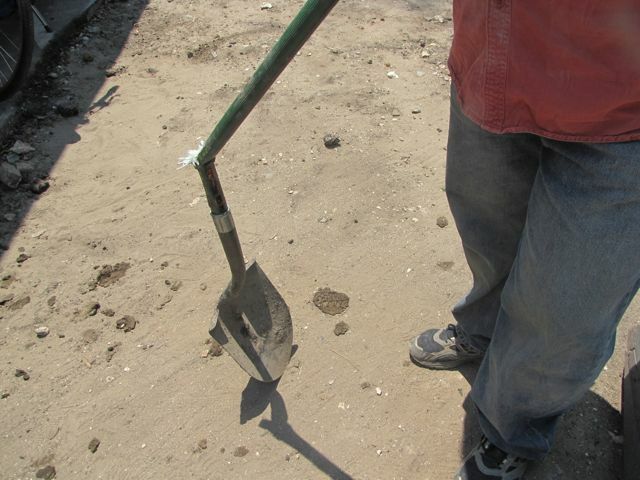 One large, cylindrical item proved to be tenaciously stuck in the mud, however, and a little extra weight on the shovel caused the fiberglass handle to shatter (see below left)! Upon closer inspection, we realized that it was not a brick or ballast stone or bottle but the top of a wooden pile, and then noticed a second once a few inches to the northeast (see below center). A quick check with the tape measure confirmed my suspicion that these piles were located approximately five feet from the the face of the redan, and that they form a line parallel to the south face of the redan. These characteristics match our records of a legislative discussion in 1702 that mentions a row (or double row) of wooden piles to be placed in front of the sea wall at a distance of five feet, back-filled with oyster shells and mud, to protect the brickwork from storms. 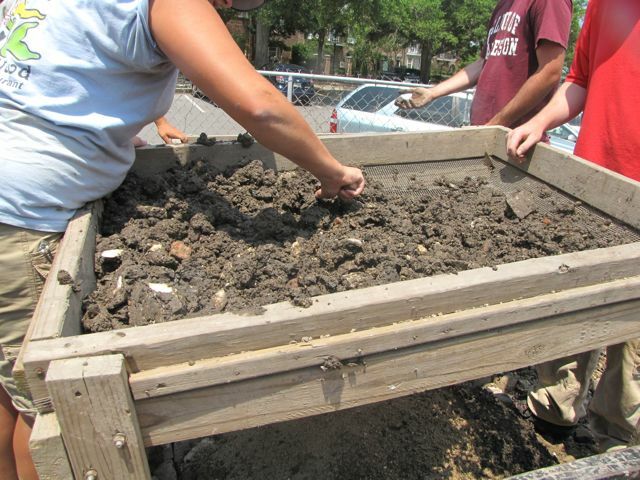 The mud surrounding the piles seems to be very interesting, but the students will have a devil of a time screening it. As you can see in the photo below right, this pluff mud is so wet and sticky that it’s nearly impossible to work through the wire mesh of the screens. Meanwhile, back at the redan, I spent some time today measuring surfaces and angles in order to create a three-dimensional model of the redan. I must say that there are many physical features here that don’t quite match the documentary evidence we have in the surviving colonial legislative records. We have much puzzling to sort out before we can theorize the “original” dimensions of the redan. 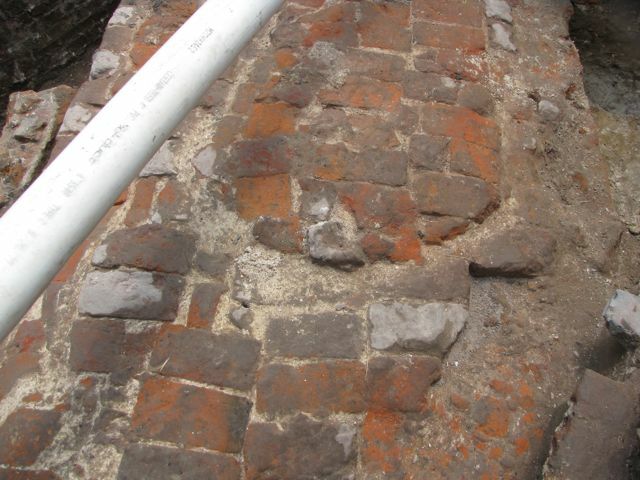 I use that term “original” loosely because the documentary evidence tells us that the redan and the brick “curtain line” running on the east side of East Bay Street were repaired, augmented, and substantially rebuilt on several occasions in the eighteenth century. Take for example the large mass of bricks laying in the mud just a few inches from the south face of the redan (see below left and center). 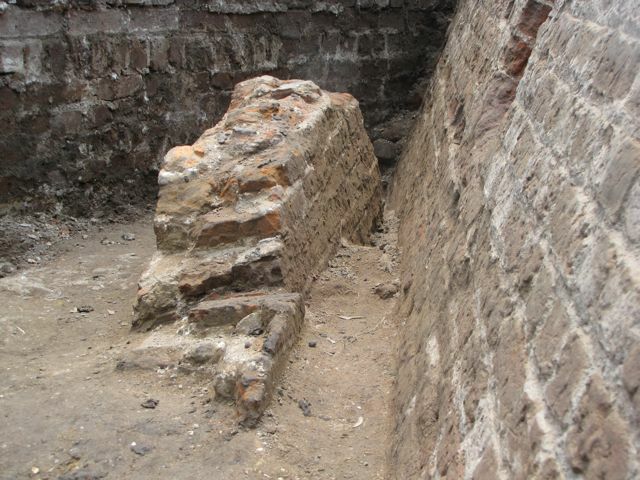 Is this a fragment of the upper part of the redan wall, or is it a fragment of the lower part of what was once a pair of thin brick walls forming the back and front of the redan, filled with mud in between? The surviving colonial legislative records mention both of these options, so we may be looking at remnants of the redan from before the destructive hurricane of 1752 and remnants from after that storm. To make this matter more confusing, we can now make out two distinctive semicircular mortar patterns on the top of the redan (one of which is pictured above right, looking southwest). What is the significance of this pattern? At this level the fractured surface of the redan is 60 to 62 inches wide, and the diameter of this semicircle, located more or less in the center of the wall, is approximately 30 inches. Hmm . . . more head scratching is required.